If you have every had a Tortie 'own' you, then you are familiar with their TORTITUDE. Pixel was born with this :-) She was first spotted on a game camera where her foster mom was doing some TNR work. She showed up skin and bones and wet. She was trapped easily enough and after about 7 days getting 'tamed'....she pretty much had command of the entire household. She is a hoot!! LIVES to play. LIVES for her wand toy. Has become such a lap kitten that it is hard to sit down without her jumping on you.So far she has gotten to be friends with my cats - She loves watching other cats play and LOVES being chased by them. Pixel is what we call a velcro cat. She has to be with you all the time. This means jumping on the desk while you work, trying to get in your lap at every opportunity, etc. Now would be a wonderful time to start bonding with her new guardian. Pixel has learned the fine art of BEGGING. She has become very very good at it. Due to the fact she was feral -ish as a kitten, she will form a strong bond with her new guardian but may be a tad shy at first. She also 'talks' to you....usually when it involves Fancy Feast. 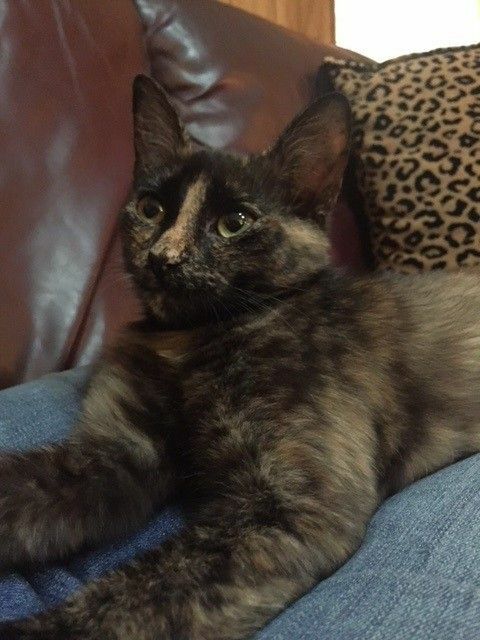 Torties are very very hard to adopt out (many people do not like their look). Would love to get Pixel in her forever home - one who will appreciate and love her!For more info. - contact Stephanie (not ASR) at 512-694-6209 or stefpq @ yahooo .comVisit this organization's web site to see any additional information available about this pet.